Our services are designed to help pioneering SME's to fund and market new products and ideas. Every company needs financing to grow. The various sources of funding have their own conditions, advantages and disadvantages.To get more insight in how and where to source financing for your innovation, a Masterclass Finance is organized. Experts will share their experiences and give an update of financial instruments in offshore wind, both public and private. The introduction of innovations in the offshore wind industry are often capital intensive. 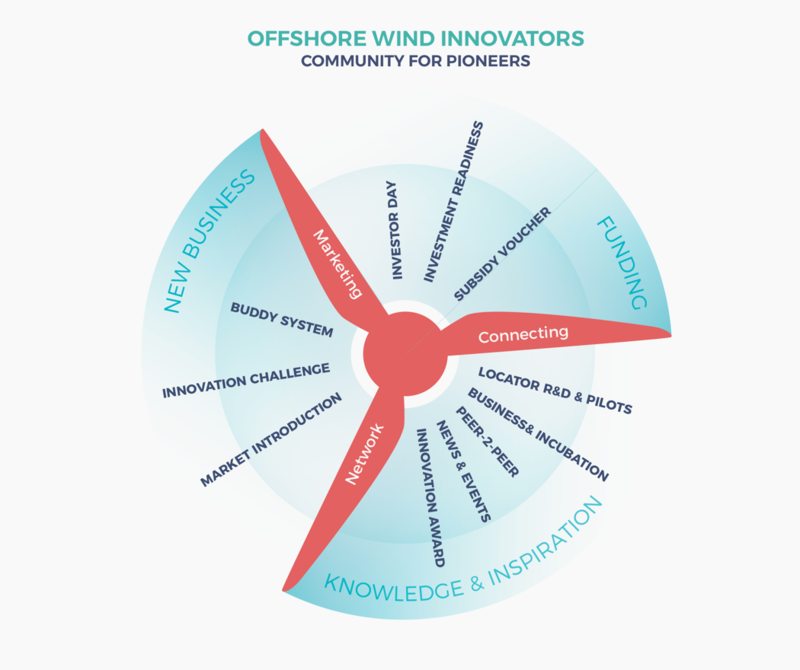 Offshore Wind Innovators and Business Angels Connect have developed a Financial Service to support the companies of our community. As a part of this service we present the Investors Day. During an Offshore Wind Innovation Challenge, a large company describes the recurrent issues they are facing and they challenge a selected group of innovative organizations to come up with solutions. During these interactive sessions, CEO's share their experiences with known entrepreneurial issues. Learning from each other is inspiring and reduces the risk of making common mistakes. Offshore Wind Innovators has awarded the Innovation Award 2018 on the 12th of December to the entrepreneur with the most appealing innovation in offshore wind. Fistuca has been awarded with the public and jury prize with its Blue Wedge Connection. Other finalists were Qlayers and TWD! We offer flexible and customized communications packages that allow innovative entrepreneurs access to media channels such as online news sites, journals, social media, events and congresses, or show how to make better use of these. Networking is one of the main reasons, innovative entrepreneurs want to join the Offshore Wind Innovators community. The success of an innovation is to a large extent dependent on establishing the right connections at the right time. Within the community, we can introduce SMEs to the right clients, investors and media contacts. In a one-on-one setting, SMEs and entrepreneurs get innovation advice from a Community Innovation Manager about their innovation strategy. The offshore wind market is a relatively new and dynamic sector. Therefore we organize workshops in which the ins and outs of this particular market dynamics, the players and the value chain will be addressed. We support entrepreneurs with an online overview/map of all relevant R&D and knowledge institutions and pilot locations, including their available facilities.